IT WAS THE SORT OF DISCOVERY that gives historians goose bumps. While researching a scholarly paper, Dan Mattausch read in an obscure diary entry penned by the commissioner of public buildings that on September 9, 1864, President Abraham Lincoln was almost killed by a gas leak in his office over the East Room of the White House. By the time he was discovered, the air was deadly with concentrated carbon dioxide, and Lincoln nearly suffocated. In just over seven months, he would be dead of an assassin’s bullet, but had he died before he was re-elected and the Civil War was won, how might it have altered the course of a nation? Dan and Nancy Mattausch spent three years restoring the Cortelyou House, from its richly woven floorcoverings to its open-flame gas lights. When you are the authority, prepare for a colorful collection of requests, from Hollywood to the White House. Mattausch helped maintain the authenticity of historic lighting on the bigbudget film Gods and Generals for Ted Turner Pictures. He provided period expertise for Oprah Winfrey’s television adaptation of Their Eyes Were Watching God. Visit the Smithsonian’s Air and Space Museum, marvel at the Wright Brothers’ plane, and just behind it are gas lights on loan from the Mattausch collection. William Allman, curator for the White House, recently stopped by for a consultation, and last year in the U.S. Senate, Mattausch lectured on “Lighting Fires in Public Buildings,” a lighthearted discussion of gas lighting in government structures. Besides founding the campus College Republican Club, and being active in the GOP at state and national levels, Mattausch was an ASSP executive vice president and opinions editor of The Falcon. Before graduating, he married computer science major Nancy Anunson ’86, whom he met the second week of her freshman year when 2nd Hill raided 6th Hill. The newlyweds went east, where Mattausch earned a master’s degree in public policy from Georgetown University and is now a dissertation away from a doctoral degree in American government. Ironically, he eventually worked in the Capitol building as a U.S. Historical Society Fellow in the Office of the Curator of the Architect of the Capitol, but in 20 years has had no involvement in politics. 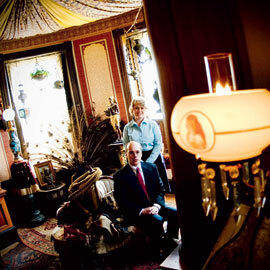 Dan and Nancy Mattausch own several historic properties within nine blocks of the U.S. Capitol building. Their current residence is the Cortelyou House, two blocks away from the Capitol — a 5,000-square-foot Victorian built in 1891, the same year that Seattle Pacific was founded. In 1900, it became home to George Bruce Cortelyou, a trusted aide to Presidents William McKinley and Theodore Roosevelt. Cortelyou was also the first secretary of commerce and labor, chairman of the Republican Party, postmaster general, and secretary of the treasury. He went on to become president of a gas company and for 26 years led its growth to become the second largest utility company in America, Consolidated Edison. Sometimes the hunt requires more than a little ingenuity and, on rare occasions, an acceptable degree of compromise. When original tubing for supplying gas to portable gas lamps was found to have hardened and rotted over time, Mattausch spent a year and a half searching for the solution. He finally discovered that a modern airbrush hose made a workable substitute. Soon a lamp base in the shape of a statuesque female holding aloft a gaslit bowl of light added its warm glow to the music room, supplied with fuel via the hose tethered to the gas and electric chandelier above. While the couple has spent hours polishing and burnishing, for extremely valuable pieces they employ conservation specialists in museum metal finishing and restoration. National Park Service historical standards are exacting, as are the Mattausches’. They insist that the primary objects in the Cortelyou House be a minimum of 100 years old. Until the Mattausches came along, important details in many national historic restorations were allowed to slide. While preservationists went to great lengths to recreate precise interiors, they commonly used anachronistic lighting that was off by at least 50 years. The craft and knowledge had been all but lost. The fact that Dan Mattausch set out to do something about that is a story of necessity being the mother of invention. While restoring the Cortelyou House, an antique lighting question arose. No one knew the answer, prompting Mattausch to visit the National Museum of American History and the Library of Congress to learn the technology of how early lights operated. Nancy Mattausch shared his passion on the decorative side of the gaslight equation and after two years, they had built a research database of over 5,000 gas lighting patents. Before he knew it, Dan Mattausch was more knowledgeable on the subject than anyone else. “The greatest research facilities in the history of mankind are just three blocks from our house,” says Mattausch. He thinks it a godsend that his wife, who writes databases and provides financial tracking for the Navy, could literally supply the in-house technical support for their historic lighting passion. Today, in a home designed for entertaining up to 100 guests, Mattausch lives and works as an independent scholar, billing himself as a “preservation consultant for historic lighting.” He enjoys working on museum projects such as Thomas Jefferson’s Monticello and the Wright Brothers’ bicycle shop, and owning and displaying the oldest surviving gas lighting objects in the country. But the most fun for him is in the simple act of “firing up the lights” and sharing with visitors the warm luminosity of a bygone age.